- Research scientists at the U.S. Naval Research Laboratory (NRL) Electronics Science and Technology Division in collaboration with researchers at University at Buffalo-The State University of New York (SUNY) demonstrate the possibility for new optical devices using graphene for communications, imaging and signal processing. "The realization of a tunable graphene polarizer has the potential to greatly enhance current infrared polarization modulation devices that are crucial to molecular sensing and identification, also playing a key role in infrared free space communications," said Dr. Joseph Tischler, research physicist, NRL Solid Sate Devices Branch. Although graphene has generated considerable interest since its discovery due to its remarkable properties that led to the Nobel Prize in Physics in 2010, one of its properties has been overseen. 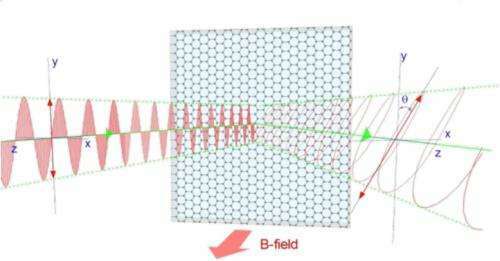 Electrons in graphene—in the presence of a magnetic field—can strongly change light intensity (amplitude modulation) or rotate the light polarization (phase modulation). "Although we have controlled this effect with an external magnetic field, the same can be done by changing the amount of electrons with a gate and keeping the magnetic field constant. This would allow for fast modulation, possibly reaching terahertz speeds," added Dr. Chase Ellis, National Research Council postdoctoral, NRL Solid State Devices Branch. Aside from the technological impact of this work, the group has developed a non-invasive, ultrasensitive 'fingerprinting' tool. This tool allows for the use of new analysis techniques.and identification and characterization of different graphene multilayers by measuring the polarization of reflected light from graphene in a magnetic field, even if they are covering up one another.